Hans Ruedi Giger is recognized as a leading artist of Fantastic Realism. Born in 1940 in Chur, Switzerland, he moved in 1962 to Zurich, where he studied architecture and industrial design at the School of Applied Arts. His first solo exhibition was in 1964, followed by the publication of his first poster edition in 1969. During this period he began using the airbrush and developed his unique freehand painting style. H. R.Giger’s book, Necronomicon, published in 1977, served as the visual inspiration for director Ridley Scott’s film Alien, Giger's first high-profile film assignment, which earned him the 1980 Oscar for the Best Achievement in Visual Effects for his designs of the film's title character, including all the stages of its lifecycle, plus the film’s the extraterrestrial environments. Giger's other well-known film work includes his designs for Poltergeist II, Alien3 and Species, as well as the unmade film, Alejandro Jodorowsky’s Dune. Throughout his career, Giger also worked in sculpture and sought to extend of his artistic vision into 3D. One endeavor was his “Giger Bars” in Chur and Gruyères, Switzerland, the ultimate in immersive art where the ceiling, walls, floors, fittings, tables and chairs were all created by the artist in the style of his acclaimed ‘Alien’ designs. The HR Giger Museum, a further extension of this dream, opened its doors in June of 1998, in the Chateau St. Germain, in the medieval walled city of Gruyères, Switzerland. The museum houses the largest collection of Giger’s paintings, sculptures, furniture, and film designs. The museum also contains pieces from the artist’s private art collection, including works by Salvador Dali, Ernst Fuchs, Dado, Bruno Weber, Günther Brus, Claude Sandoz, François Burland, Friedrich Kuhn, Joe Coleman, Sibylle Ruppert, and Andre Lassen, and a space for rotating exhibitions of other artists. In 2004, Museum Halle Saint Pierre in Paris, France hosted a six-month exhibition "Le monde selon H.R. Giger" (The World According to H.R. Giger), which was was the largest exhibition of the artist's work to take place outside of his native Switzerland, with more than 200 pieces spanning four decades of Giger’s career. During this time, he received the prestigious award, "La Médaille de la Ville de Paris", at Paris City Hall. The Paris exhibition was followed by ‘H.R. Giger in Prague” in 2005 at the National Technical Museum of Prague, in the Czech Republic and in 2006 by “Giger in Wien” at the Kunsthaus Wien, in Austria. In July of 2007 Giger was honored with his first museum exhibition in the city of his birth, at the Bündner Kunstmuseum, in Chur, Switzerland, followed in October by his first major exhibit in Spain, at The Polytechnic University of Valencia. From 2009 through 2012, his work was exhibites at major shos at the Deutsches Filmmuseum in Frankfurt, Germany, the SALA KUBO – KUTXA, in San Sebastián, Spain, the Tampere Art Museum in Finland, the Kunsthaus Wien, Austria, as well as other venues in Hamburg, Germany and Moscow and Istanbul. H.R.Giger is widely known for his singularly disturbing, surreal, biomechanical artwork and has worked for movies, games, and for the music industry. 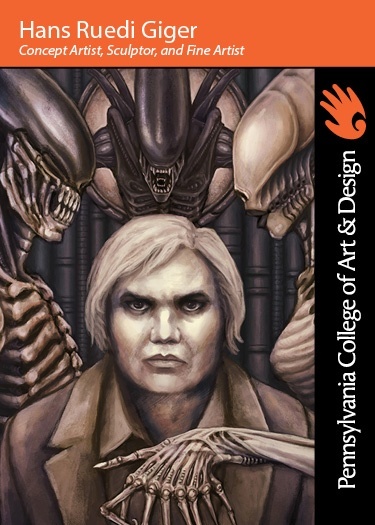 Giger studied architecture and industrial design in school. He was heavily influenced by Ernst Fuch’s Fantastic Realism style. He designed the signature microphone stand for the metal band Korn. He has designed multiple Giger Bars in locations such as Tokyo, New York, and his hometown of Chur, Switzerland, and one attached to the Giger Museum in Gruyères. Many works in his permanent collection are housed in the Giger Museum, in the medieval Château St. Germain in the 400 year old historic, walled city of Gruyères, Switzerland.